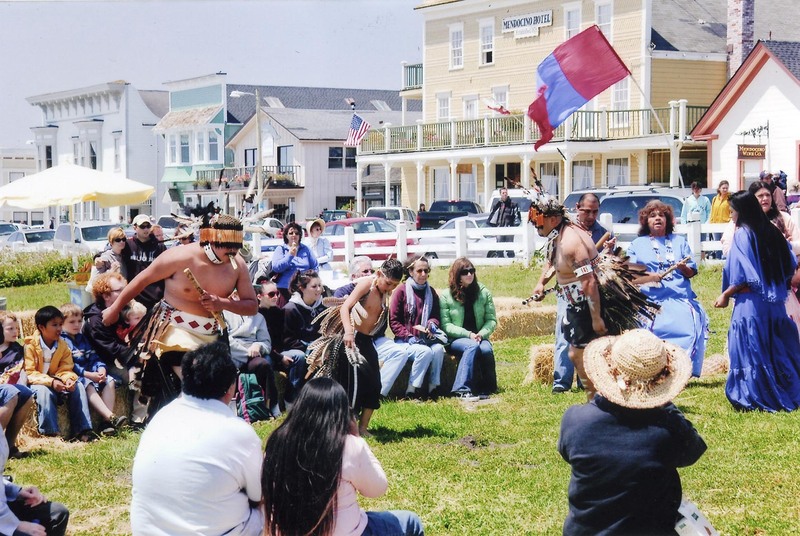 Each year, Mendocino celebrates Heritage Days, featuring living history reenactments. Mendocino, California, (population 1,100) is located on the Pacific coast about 150 miles north of San Francisco. The village developed around a mill built in 1852 amid forests of giant redwood trees. The founding mill owners and workers brought their wives from the East and built Victorian/New England style homes, churches, banks, and stores. The area subsequently attracted settlers from Finland, Canada, and especially China. Mendocino thrived until the 1930s, when the lumber industry diminished, leading to a dramatic decline in the town’s economy and population. In 1959, the creation of the Mendocino Art Center drew artists and began to revitalize the dormant, run-down town. Today, tourism is Mendocino’s sole industry. Recognized for the quality of its architecture and the integrity of its natural setting, the Mendocino and Headlands Historic District was named to the National Register of Historic Places in 1971 and also has local protection. It is filled with historic late 19th century buildings built from the local redwood, such as the Mendocino Presbyterian Church and the Masonic Hall. Because of its resemblance to coastal villages in New England and the Maritime Provinces of Canada, it has been used as the location for filming movies such as “Jonny Belinda,” set in Prince Edward Island, and TV programs such as “Murder She Wrote,” set in Maine. In 1974, local volunteers saved Mendocino from a large-scale development project, and Mendocino Headlands State Park was established adjacent to the Historic Preservation District. Mendocino has five house museums, including the Kelley House Museum, located in an 1861 Mendocino home and featuring displays on the town’s logging history and its unique Victorian/New England architecture. Other museums are the 1909 Lightkeeper’s House Museum and Point Cabrillo Lighthouse; the Ford House Visitor Center, built in 1854; and the Guest House Museum, built in 1892. Additional attractions include the Temple of Kwan Tai (a California State Historic Landmark), built in 1854 and restored in 2001, and the Mendocino Art Center, which offers exhibits, workshops, concerts, and other special events. The Mendocino Study Club, founded in 1908, recently developed a walking guide highlighting 29 of the town’s historical buildings. Each year, Mendocino celebrates Heritage Days, featuring living history reenactments, Full-Moon Cemetery Tours with costumed actors telling their stories by lantern light, guided walking tours, and historic preservation presentations. Every February, the Children’s Chinese New Year Parade honors the contributions of the large numbers of Chinese who have lived in Mendocino from its earliest days.